Air ducts, or vents, move air throughout almost all buildings, including houses and commercial buildings. All of these ducts need to be cleaned to remove dust, debris, and mildew so they can provide clean, pollutant-free air to breathe. Homes, especially those that have household members with breathing problems, need air ducts cleaned regularly. Because many homeowners don't have the equipment, time, or knowledge needed to clean their air ducts without help, an air duct cleaning business can be a very lucrative and successful business idea. 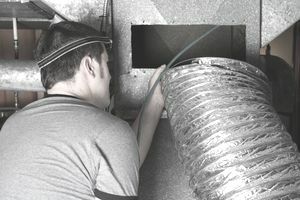 Cleaning air ducts is a skill that requires considerable training and experience before getting to the point of being able to run a business. According to the U.S. Bureau of Labor Statistics, some states require heating, ventilation, and air conditioning (HVAC) technicians to be licensed, so be sure to consider the requirements where you live. Even if a license is not required, finding employment in the field will require some postsecondary education and training and likely an apprenticeship. The most likely path to starting your own business includes working for someone else to gain experience and knowledge of the market and industry before venturing out on your own. Median annual salary for HVAC professionals in 2016 was $45,910, according to the Bureau of Labor Statistics. There is growing demand. The U.S. Department of Labor Statistics projects a 15 percent growth in the industry during the decade from 2016–2026, due mostly to increased residential and commercial building construction during that time. Running your own business means you can specialize. For example, maybe you're familiar with the real estate market in your area and can build a strong base of residential clients that way. There are franchise opportunities available that might be preferable to operate completely independently. Running a local franchise still allows you to own your own business, but a framework for success is already in place and can provide support. As well, whichever franchise you choose likely has name recognition your independent business might lack. Startup costs can be significant. Vacuum systems needed to perform the work can cost several thousands of dollars, and you also will need additional tools and probably a van or truck to transport equipment. You may have to hire one or more assistants or take on an apprentice of your own. Some jobs are big enough they may require two people to do safely and effectively. Keeping up with training, certifications, and professional memberships can be expensive. Membership in the National Air Duct Cleaners Association (NADCA) is recommended and costs $895 annually as of 2018. Members are listed on a national registry, and some commercial or governmental clients will require such affiliation. An online course to earn NADCA certification costs $395 for members and $595 for nonmembers.